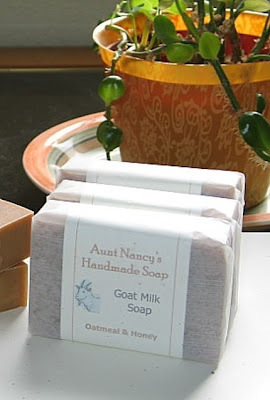 My friend and favorite soapmaker, Nancy Goodwin, has just launched her new website! Nan's business, Aunt Nancy's Handmade Soaps, has been my favorite for two years now. I remember that day in early February 2008 when I was looking for some handmade soaps without palm oil on Etsy. I came across Nancy's shop and decided to try three bars. I have never found a better soaper and cannot speak highly enough of the quality of her soaps. I have tried dozens of bars since that time and even asked Nancy to make a special facial bar with royal jelly and local New York honey for my skin care business. I adore her Rose Clay bar, all of the unscented bars, and several others. My favorite scented bar is a toss up between Island Coconut and the bar with swirls of cocoa and peppermint. Check out Aunt Nancy's new website today. She has a great offer going on: Buy 3 or more bars, get 1 free! Valid through February 14th.